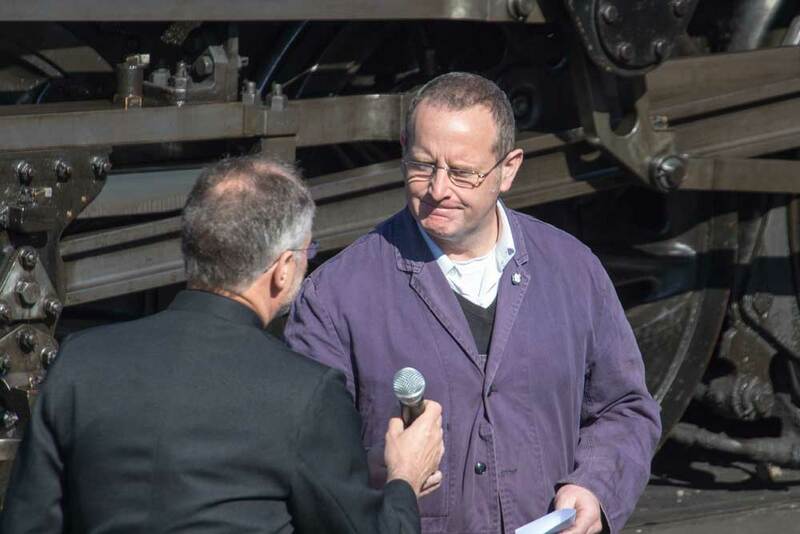 As part of the Haworth 1940’s Weekend in commemoration of the D-Day landings 70 years ago, at 9.30 on Saturday 17th May, Haworth Locomotive Works was witness to the ceremony of thanksgiving for the restoration of wartime locomotives WD 2-8-0 90733 from the UK, once more named for the day ‘Remembrance – less we forget’, and USTAC 2-8-0 5820 from the USA. 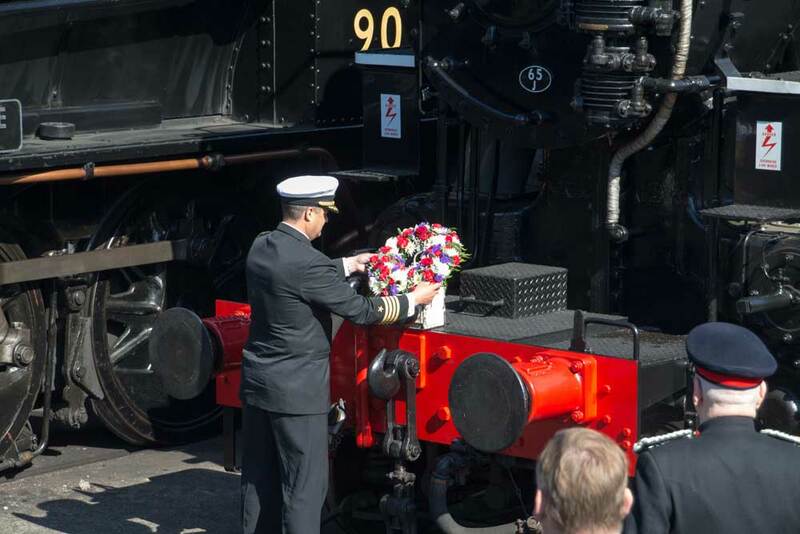 The intention of the ceremony was to give thanks to God for the restoration of the two engines. 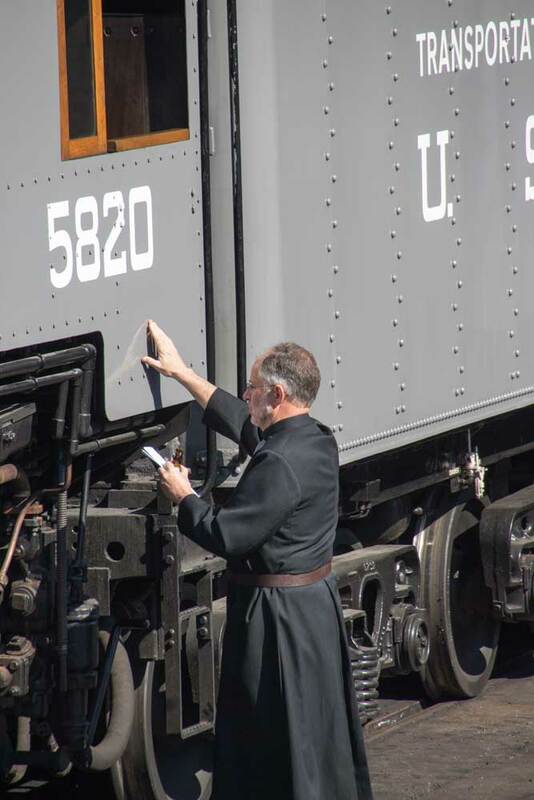 To give thanks for those who have worked hard to get the engines to their present state, to ask God to bless those who will “drive” them and the visitors who will ride on the trains. 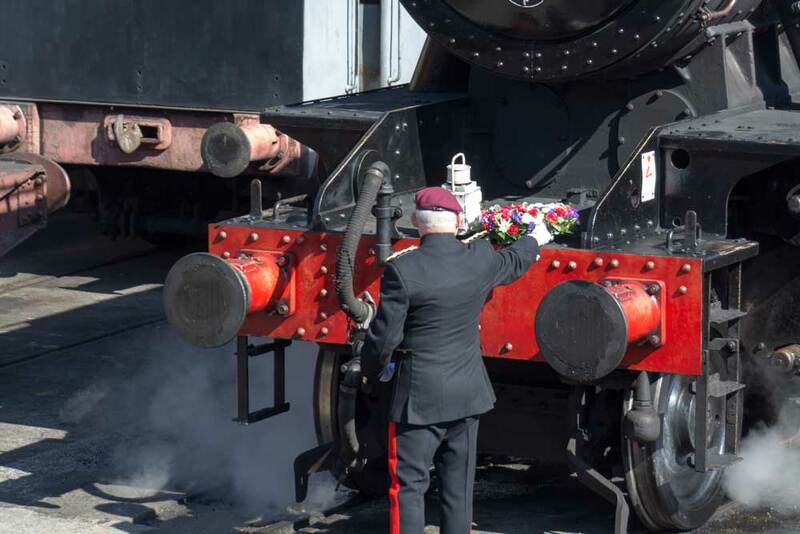 To remember those men and women from the Second World war who have worked on their sister engines and those who were transported to the areas of war by them. 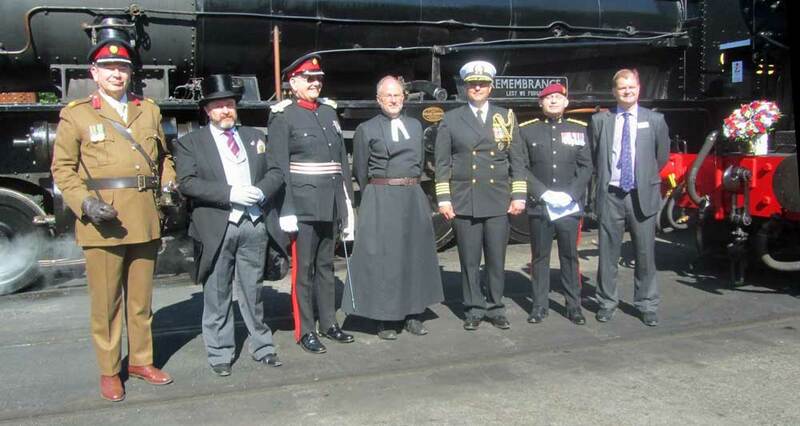 The event was attended by invited guests including West Yorkshire Deputy Lord Lt. Major S. M. Hardy, Major Stephen Boardman, Regimental Administrative Officer of 4 Para and Captain David A. Stracener, United States Naval Attaché to the U.K. together with Dr. Matthew Stroh and David Pearson, Chairman and Vice-President respectively of the Keighley and Worth Valley Railway Preservation Society and working members of the Society. The Herr Jens’s Band provided instrumental accompaniment to the ceremony. As part of the planning for the invasion of Europe, the UK and US governments considered the likely motive power position. Both countries built locomotives for main line and shunting operations and the Railway is unique in having examples of all these designs. It is the only place in the world to have this distinction. 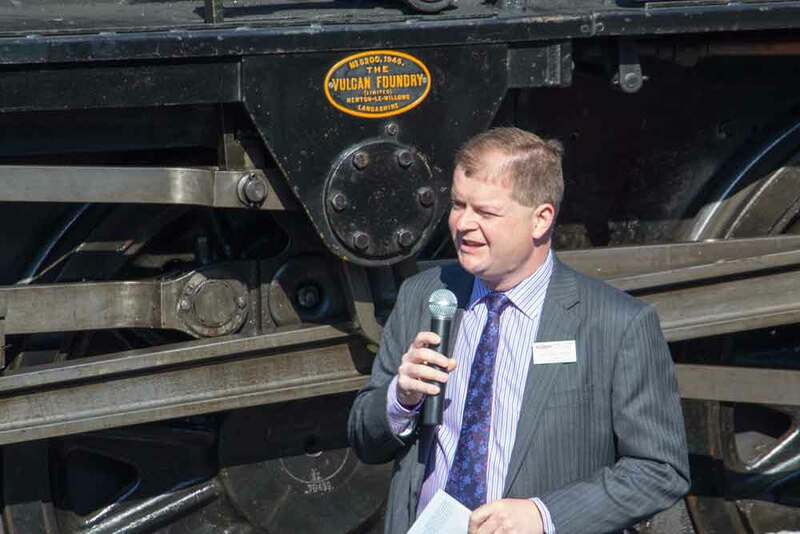 At a cost approaching £1M, which has included assistance from the Heritage Lottery Fund, the railway has, using its own staff and qualified volunteers , rebuilt its UK and US main line locomotives and they have both recently re-entered daily service. This is the first occasion since the end of World War 2 that it has been possible to see an example of each type together, let alone actually in use; although many of the US design remain in many places all over the world, there is only one survivor of the UK design, which is at Haworth. 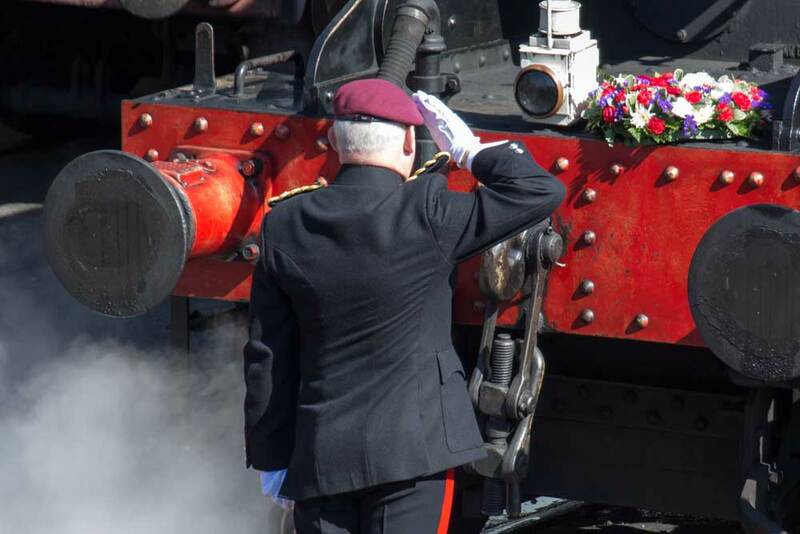 In terms of their historical contribution and importance, the two locomotives are comparable with the Spitfire and Mustang fighters. It is correct to say that without these two designs of locomotive, now uniquely presented in use at the KWVR, the advances into Europe after D-Day would simply not have been possible. The ceremony was opened by Dr. Matthew Stroh with a welcoming introduction to the invited guests and working members. 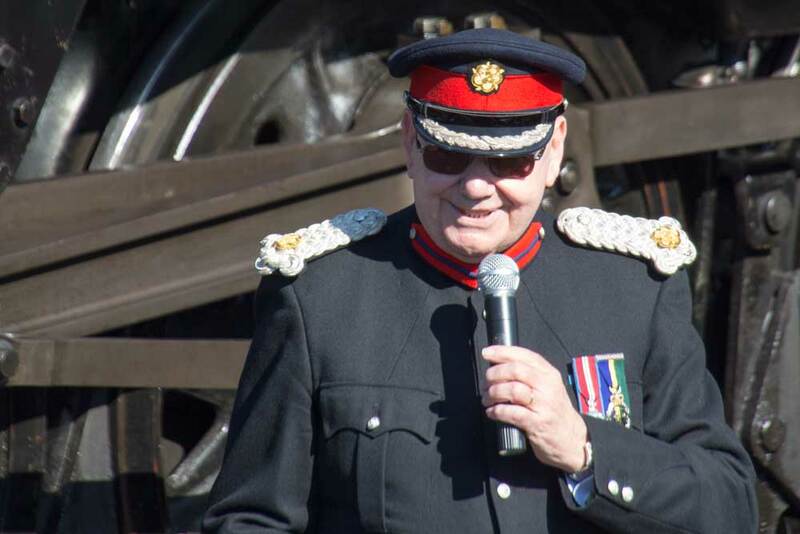 Dr. Stroh then passed over to Deputy Lord Lieutenant Major S. M. Hardy who made a short speech recognising the work of the restoration team. 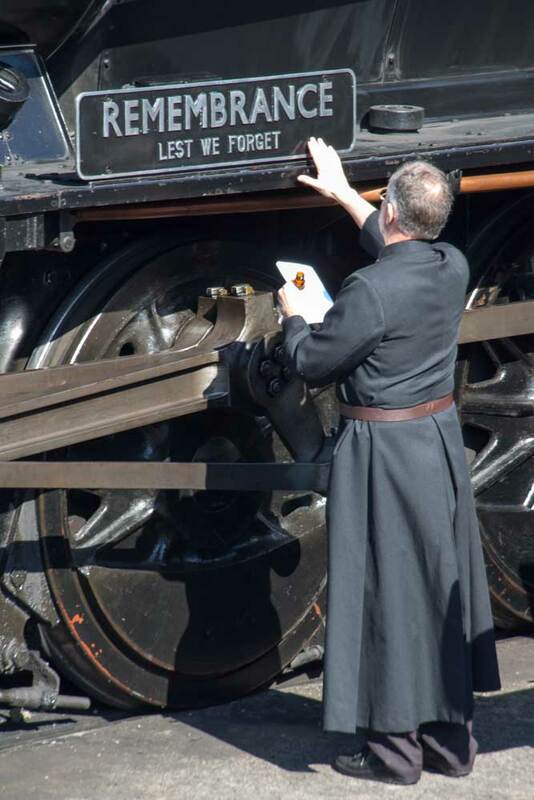 The Liturgy and ‘Blessing’ was given by the Reverend Peter Mayo-Smith, Rector of Haworth, and Psalm 121 was read by working volunteer, Andrew Simkins from the Keighley and Worth Valley Railway Preservation Society. 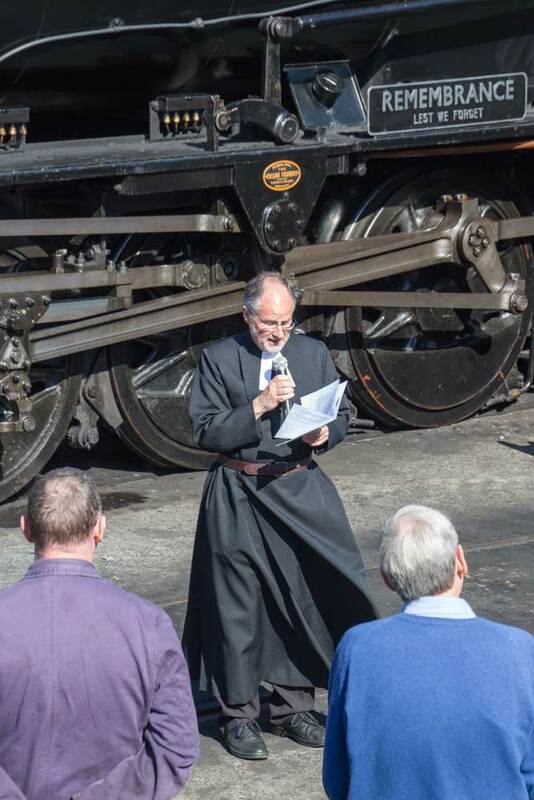 This was followed by Prayers and Thanksgiving by Reverend Mayo-Smith and the “Blessing” of the Locomotives made by the Reverend with consecrated olive oil on each engine. 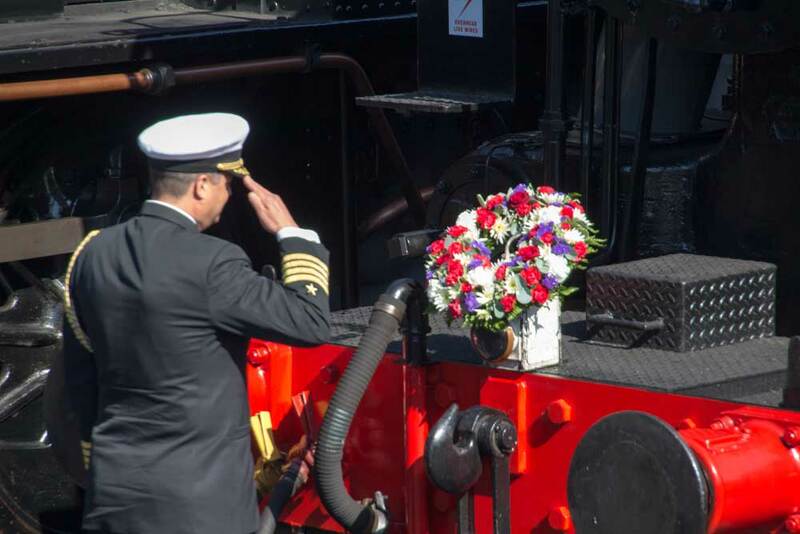 After the ‘Blessing’, the national anthems of both countries was followed by Captain Stracener , on behalf of the U.S.A. armed forces, and Major Boardman, on behalf of the United Kingdom armed forces, laying wreaths on their respective locomotives to conclude the ceremony. 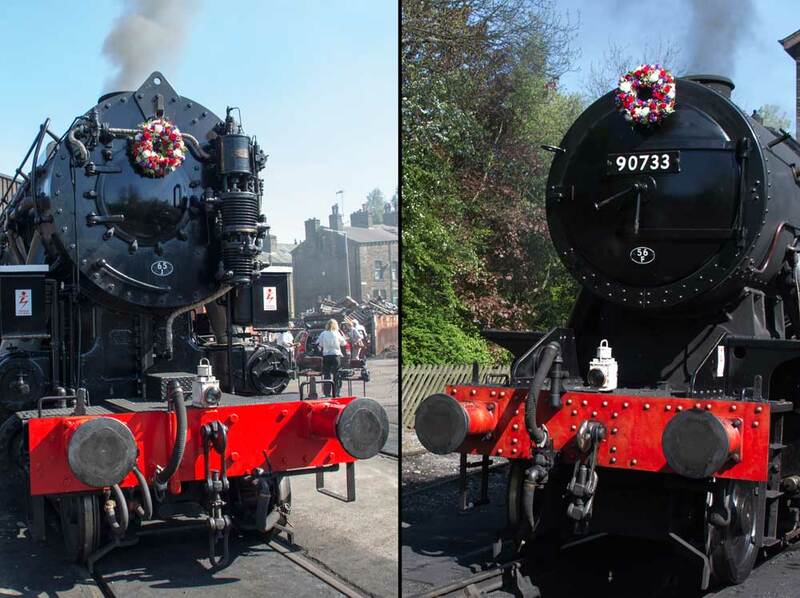 Both locomotives, with their wreaths adorning their smokebox doors, were then prepared in Haworth yard for their service turns.